One of my favorite animals in the world is the octopus. I keep reading stories on the internet about how they are not from earth but aliens of another planet according to their DNA structure, etc… Yes, they are smart but at the same time, they are really tasty. I guess my relationship with the animal isn’t as upright as I’d like it to be. I love elephants but you don’t see me eating them…or maybe they don’t taste great. Anyways, here’s a recipe if you ever come across some baby octopi…octopuses. In case you were wondering…from what I’ve researched, octopi and octopuses work. Also, for full disclosure, it will not look like the picture. 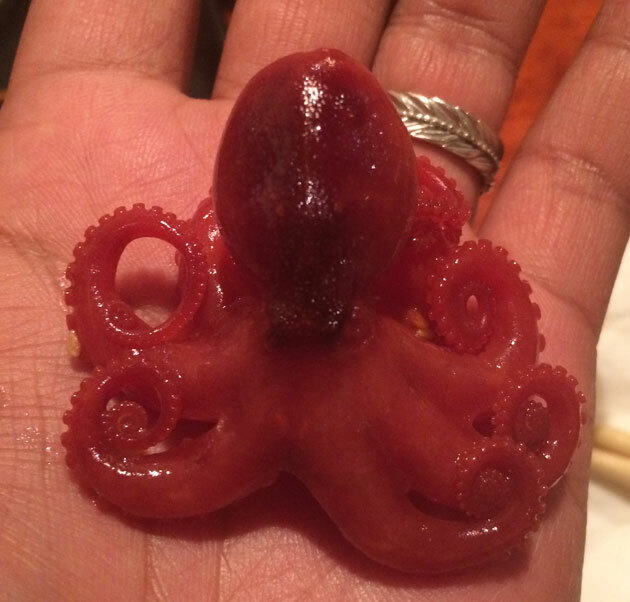 Remove beaks from the octopus. Add all the ingredients together in a large bowl. Massage the ingredients (yes, with your hands). You’re trying to tenderize the meat so massage it for 15 minutes. Cover and put in the refrigerator overnight. No, not 3 hours, not 4 hours, overnight so we’re looking at least 12 hours. After the 12 hours are done, discard the marinade. Now here’s the fun part, you can cook the octopus in a skillet or the grill. If you decide to use the skillet, I recommend cutting the octopus in halves. If you decide to use the grill, you can leave them whole. When using the skillet, heat the pan over medium high heat. Add a little oil and the octopus. The octopus will lose that transparent look. Stir it around and cook for 22 minutes. Done. When using the grill, pretty much the same process; just don’t let them fall through the grates. In fact, you can probably skewer them and don’t be afraid of the burnt parts. The burnt parts taste great.